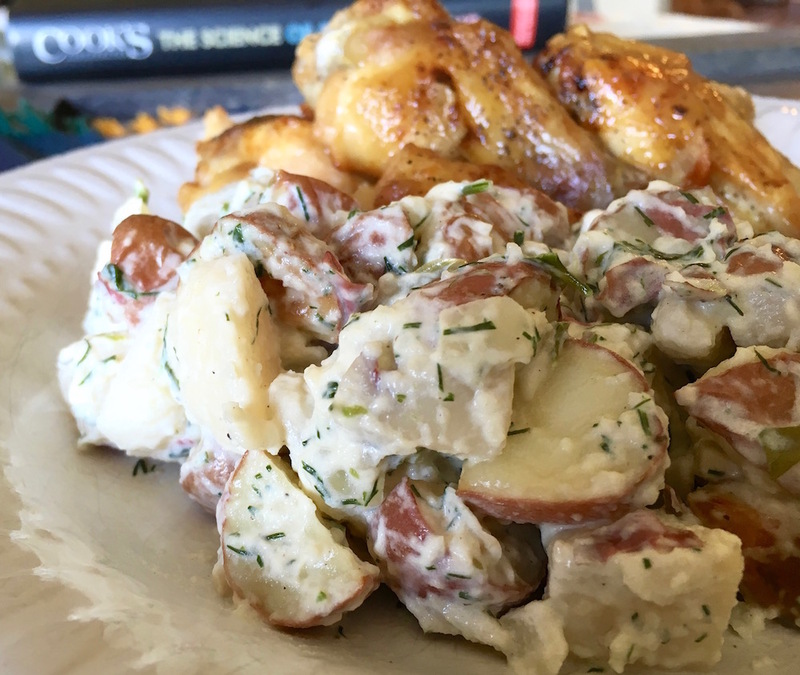 Nothing says “picnic” like potato salad. Fresh herbs add a lot of flavour to this creamy version that comes together in just a few minutes. For best results, make this dish a day in advance so the flavours have a chance to fully mingle. Place cut potatoes in a large microwave-safe dish and add 2 T. water. Cover and microwave for 2-3 minutes or until fork tender. (Cooking time will vary by microwave, so check after 2 minutes. Potatoes should be tender enough to split with a fork, but still firm). Remove potatoes from dish and spread out in a single layer on a baking sheet to dry. Blot gently with a paper towel, if needed. In a small glass bowl, add mayonnaise, yogurt, shallot, mustard and fresh herbs. Stir to combine thoroughly. Add potatoes to a separate bowl and gradually add mayonnaise mixture and toss to coat. (Don’t add all of the mayonnaise mixture at once in case you decide you want less on your potato salad). Season with salt and pepper, to taste.